Lately, my scanner was been going crazy. My mum in-law gave me a check and we can scan our checks to deposit them in our bank. But for some reason the old scanner was not scanning the check properly. I thought it was broke because I accidentally kicked it with my foot and it fell on the floor. So , I was convinced it was really broke because when I tried to scan the check it turned out black and wavy. I was so pissed. I spent a lot of time trying to get it scan properly but to no avail it just seemed to worse. I had the feeling due to the software anti-virus my Babe Dako downloaded in my computer which made my scanner act crazy, but I was not sure it was the anti-virus so I still believed the scanner was broken. So, today we decided to buy a new scanner we went to Sam's Club to find the best quality scanner at a good price. 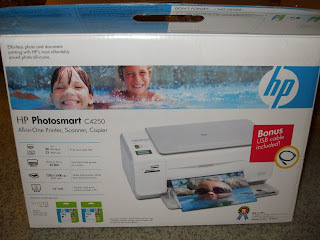 So this is what we got a HP C4200 ALL-IN-ONE scanner, printer and copier. 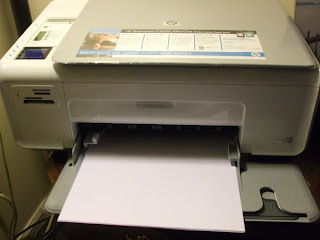 I really like this because I can do everything in it and it takes up less space than both scanner and printer before. It worked fine when I tried to scan something but, when I tried to scanned the check again it went black again, oh my goshh. My Babe Dako helped me figure out what's wrong. Why I could not scan the check to my bank anymore. Guess what, he finally figured out it was because of that stupid anti virus software he downloaded in my computer. When he disabled the anti-virus it finally worked. 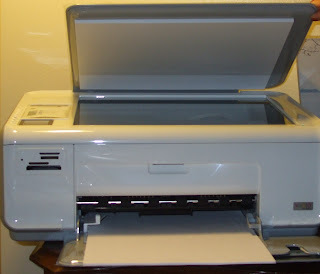 That means, my old scanner is not broke hehe..So now, I have to get rid of my old scanner and printer because we bought a new all-in-one scanner, printer and copier. I love the new scanner because it produces better quality, it is also very easy to copy my pics from the camera since I can just put the memory card into a slot on the printer and boomm.. I have all the pics saved to my computer and ready to print whenever I want to.